One thing I undoubtedly inherited from my mother is her ability to remember dates, events, and milestones like nobody's business. She starts her countdown at least six months ahead of an event and sends out reminders to everyone involved at regular intervals of months, weeks, days and sometimes, even hours leading up to said event. And once the event is over, just as everyone begins to let out a sigh of relief, she starts Phase 2 which is basically 'This Time Last [fill in the blank]'. Again, she could start it within a couple of hours or days and continue it all the way up to years after the event. As much as I found this habit of hers tiring, I ended up imbibing it from her. 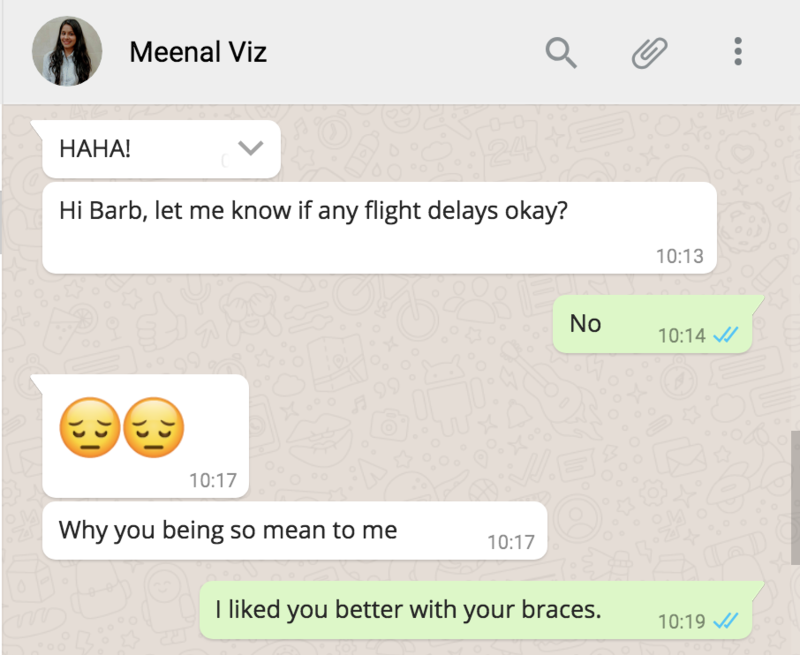 And years later, as much as Meenal liked making fun of me for this tendency, she slowly started turning into me my mother too. Bubsyatrics, by the way, is Pediatrics in Meenal if you hadn't guessed already. But can we just pause and look at all three of those messages she sent me? Specimen 1: Counting back to the number of hours before she has to wake up. Specimen 2: THIS TIME LAST WEEK! Specimen 3: Worrying about something 10 days into the future. I have said it before and I will say it again: If I ever have a daughter I want her to be a Meenal. 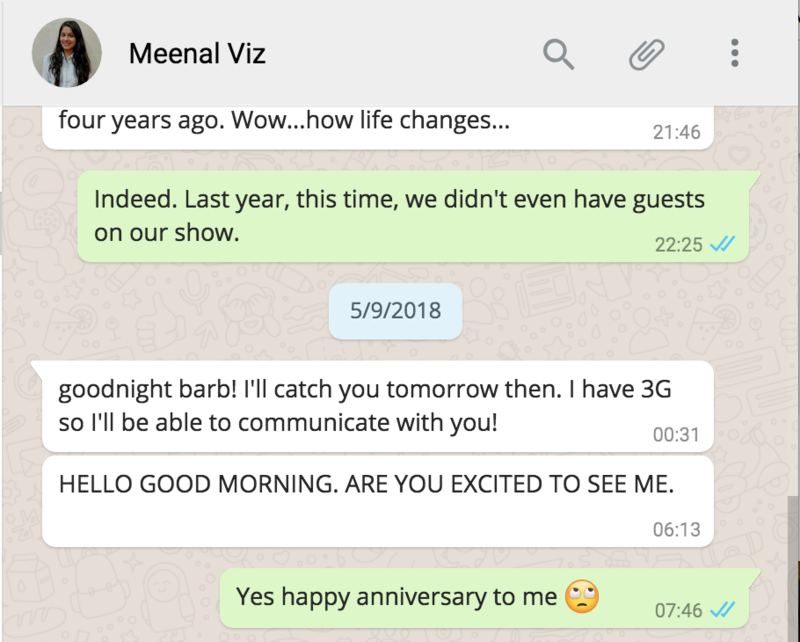 But going back to This Time Last Week when Meenal and I appeared on TV on my third wedding anniversary, I passive-aggressively made it known to her that I wasn't pleased to have her third-wheeling on our special day. My grumpiness soon turned into terror after I watched her regulate the traffic in London to come running towards me in order to crush me in a bear hug with those massive tennis playing arms of hers. From that moment on, there was not a second of quiet or peace in my day. 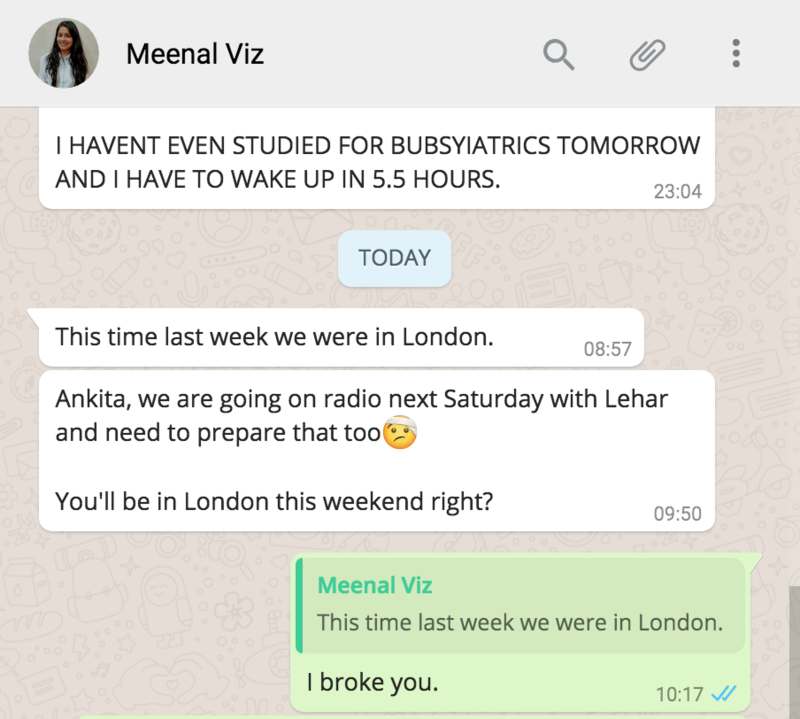 But that last picture, that moment right there, is when I realised that being on live TV with Meenal is a scary business. Don't be fooled by that solemn expression on her face or the nonchalant way in which I'm turning my head away from her because the things she was saying after having been mic'd up were threatening to make my head explode. Now that I think of it, she probably was a bit nervous (as one would be in such circumstances) and her coping mechanism was basically to NEVER SHUT UP AND LAUGH A LOT!!! In all-caps, complete with three exclamation points. "ANKITA! ANKITA ANKITA GUESS WHAT?" was something she often repeated without giving me space to either guess or ask what. "I'm worried that I might have bad breath" came up a couple of times followed by "What if I answer a question and she (the host) passes out? Would that mean that I single-handedly disrupted a live TV show? Actually, do you know if anyone's done that before? Can I borrow your phone, I want to Google that." Then there were the bits where she'd shout something out to Shane who was standing at the other end of the studio because she'd just thought of a joke that would be especially relevant to him RIGHT THEN. Often, she would remark that she could never be a part of a reality show where she'd be hooked to a mic because nothing that came out of her mouth could be aired uncensored. "It's good to be self-aware like that", I said in the hopes that she'd shut up because I seemed to be the only one aware of all the side eye we were getting. I could sense everyone starting to feel conscious of this "presence" in the studio, this presence that threatened to never shut up even after going live. Finally, just when they announced that we had 60 seconds left until we were to go live, I started becoming aware of another presence in the room. A presence that usually tends to take a monstrous form when it erupts from Meenal, a presence I was all too familiar with. Meenal was about to rip a fart. Just kidding! No, not a fart but I knew that she was about to burst out laughing. Just to be clear, there was not a single stimulus to this sudden bubbling of laughter within her except for the announcement that we were going live in 60 seconds. All I could do in that situation was make as much eye contact with her as possible and repeat the word NO, sternly and strictly, as one would to a child or a puppy. Then, soon after they announced that we had 15 seconds left, the title track of the show started playing and I clearly discerned the meaning of her sudden intake of breath. 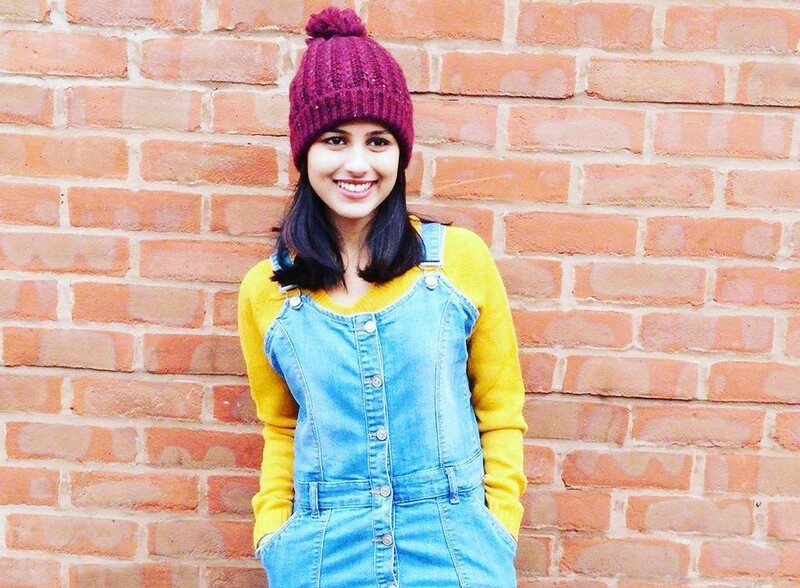 I even counted back in my head - three, two, one - and right on the spot, the all too familiar shrill of Meenal's laughter pierced through the silent studio. Everyone remained still. Nobody dared to move a muscle. The host, the other guests, the cameramen, Shane, everyone. And those of us who were at that moment about to go live on camera attempted to plaster a smile across our faces and pretend as if this was just another normal day in the history of live television. Thankfully, the laughter escaped her while the title track was still playing so it didn't get picked up on camera but I still feel bad for our poor host who must have been mortified mere seconds before she had to welcome everyone to the show. I'm sure that in the coming years, I'd forget a lot of things pertaining to Desi Outsiders. But I have a feeling that our first ever live TV appearance wouldn't be one of them, thanks to my co-host and the girl I want my future daughter to be modeled after.